LED Teeth Whitening is a bleaching system that lightens the discolouration of enamel and dentin. You may have seen Laser Whitening being used in shows like Extreme Makeover and America's next top model. The LED Whitening system is used by our celebrity clients at our Clinic very frequently. Thanks to the LED advanced power teeth whitening system we can help you achieve up to 8 shades whiter in just one hour's appointment. The LED Teeth Whitening procedure is safe, effective and only performed by our highly qualified dentists. The easy and non-invasive system will lighten your teeth up to eight shades returning them to their beautiful, natural white. The procedure begins with a short preparation with a cheek retractor which is placed in the mouth, leaving only your teeth exposed to the LED light. The dentist will apply the whitening gel which is specifically formulated to work with the Teeth Whitening laser light. The gel and the light work together to gently penetrate the top surface layers of your teeth to remove stains and discolouration. The gel will be applied for three fifteen minute sessions for a total time of 45 minutes, removing and cleaning your teeth after each 15 minute cycle. This extra step allows our dentist to closely monitor your colour. Once the three sessions have been completed, your teeth will be cleaned and you will go home with a brighter, whiter smile, in just one visit to our Clinic. 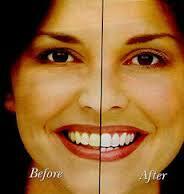 The complete LED Teeth Whitening procedure takes one hour. The procedure begins with a 10 minute preparation followed by three fifteen minute applications of the gel and LED light. How does the LED Teeth Whitening procedure really work? The led activated whitening gel's active ingredient is Hydrogen Peroxide. As the Hydrogen Peroxide is broken down, oxygen enters the enamel bleaching coloured substances while the structure of the tooth is unchanged. The LED light activates the hydrogen peroxide and helps it penetrate the surface of the tooth. A study has shown that use of the UV lamp increases the effectiveness of the gel by 26% or more, giving an average improvement of 8 shades. The answer is up to six months, on average. By following some simple post whitening care instructions, your teeth will always be lighter then they were before. To keep your teeth looking their best, we recommend flossing, brushing twice daily, and occasional touch-ups with the whitening pen or the Home Teeth Whitening kits. These are professional formula products designed specifically to keep your teeth brightest and can be ordered for you should you wish to perform the occasional top-up whitening in the comfort of your own home. In some cases, a small number of patients with sensitive teeth can experience some discomfort during the treatment. The LED light generates minimal heat which is the usual source of discomfort. On rare occasions, minor tingling sensation are experienced immediately after the procedure, but always dissipate. You can also ask your dentist to supply you with anti-sensitivity toothpaste for use prior to treatment. A few thousand to date (3000 approximately in the last 3 years), all of them performed by our leading cosmetic dentists at our Romford Clinic. Fillings and crowns can’t be whitened in the same way, however our experience shows that white fillings and porcelain crowns react very well to the peroxide gel and they appear cleaner and whiter than before.In any case, thanks to our approach we can always match the whitening shade to the shade of your filling or crown. Yes. Extensive research and clinical studies indicate that whitening teeth under the supervision of a dentist is safe. In fact, many dentists consider whitening the safest cosmetic dental procedure available. As with any tooth whitening product, the product is not recommended for children under 16 years of age and pregnant or lactating women. Disclaimer: The Hydrogen Peroxide is 6% Concentration as of the new regulations on the 31st October 2012.